When we began visiting evacuation centers, we didn’t know how the organizers would receive us, but in every place, we were very well received, and most of them seemed to understand that since the immediate crisis of physical survival has been taken care of, that the emotional care (heart care) of the evacuees is of prime importance. 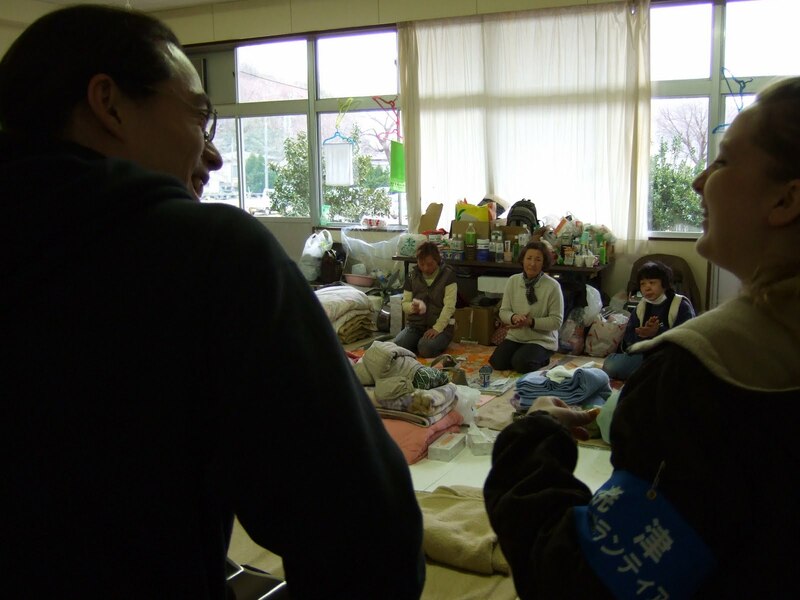 At the first Evacuation center we visited, Horii-san gave a small speech about our hearts knit together in this time, but she needed to stop and get a hold of herself when she began to cry. At the next centers she kept it together and got though them without breaking down. In every place we sang, there were people who cried. When I saw someone begin to cry, I needed to look away, or I knew I would cry too. We knew that if we walk around crying, it really won’t help encourage these people to give them the faith to go on. 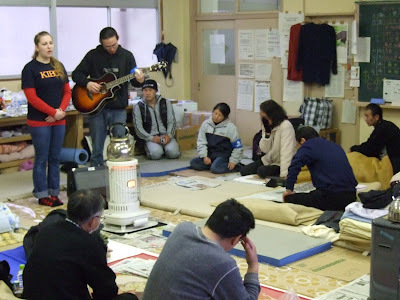 In this room, almost every person cried while we sang. We thought we might have made a mistake in our song selection, but everyone was so thankful and appreciative, bowing to the ground and thanking us over and over. It seems that for many of these evacuees, this is the first time they have relaxed, and let down their emotional walls and allowed tears to finally flow. When we sing, some just sit there with their eyes closed and drink in the music, as if they are bathing in a heavenly stream. We’ve seen some documentaries recently where psychologists explain the need for some emotional outlet for people who have gone through traumatic or horrific situations. Some recent reports go as far as to suggest that from this point on, the emotional care of those still in evacuation centers, is the most important thing. I have never seen so many people cry, but at the same time, I have never seen so many people smile through their tears and be so thankful and appreciate of our small efforts of encouragement. This woman was looking through the pages of her photo book over and over again. 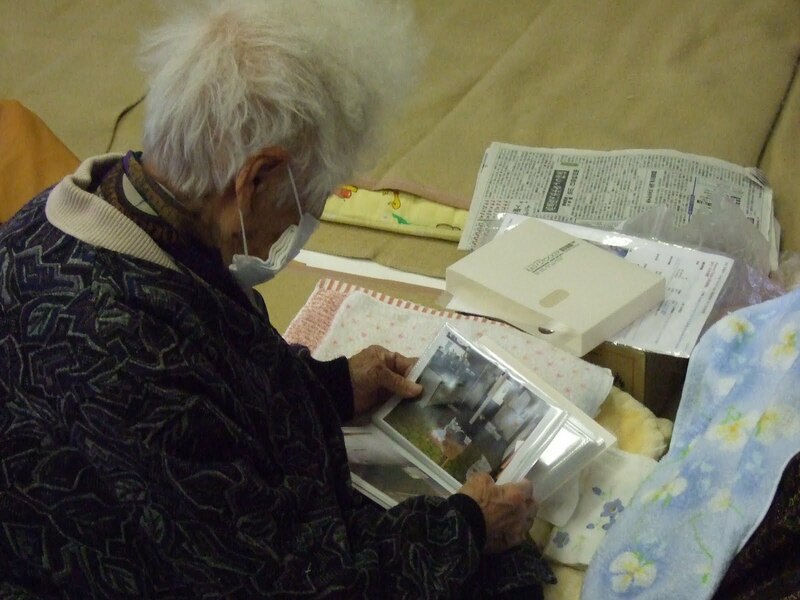 When I went to talk with her, she showed me some of the photos. They were of her house which is no more. We all have soooooo much do. GBY guys... great work.